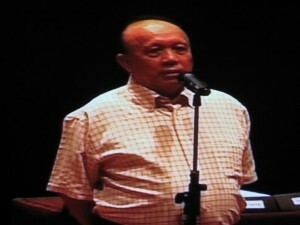 On 26 February 2006, an idea mooted by history teacher Lim Cheng Tju to his friends in the arts scene came to fruition: to have former political detainees break the silence and speak of their experiences at a public forum. The result was the ‘Detention-Healing-Writing’ forum, presented by The Necessary Stage (TNS) as part of the Singapore Fringe Festival. The speakers were former student and trade union activists Michael Fernandez (MF) and Tan Jing Quee (TJQ), and Robert Yeo, a playwright who had broached the topic of political detention in his plays. Also present were the event’s chairman and moderator, Tan Chong Kee (TCK), Haresh Sharma (HS) of TNS, and 200 other people squeezed into the Esplanade Recital Studio. TCK: We know very little about the players who lost the political struggle in Singapore in the 1950s and 1960s. Many of them were detained without trial for many years and most of them have chosen to remain silent after their release. The charges of being a communist or a communist sympathiser have also obscured much of what really happened. That has led to a somewhat lop-sided understanding of the founding history of Singapore as a nation. We are really honoured to have with us today our guests, all intimately involved, especially Jing Quee and Michael, in the turbulent events of that time and to give us their account of what happened. I will like to frame this forum by the quote Jing Quee wrote in reference to the life of Said Zahari, another notable figure in Singapore’s history, who can’t be here with us today. What Jing Quee said is that Said’s experience as a victim reaffirms, however, that the indomitable human spirit can rise above tragedy to reclaim a fundamental human dignity and integrity. This is what we like to focus on today because the time is still not ripe to discuss some very fundamental and key topics surrounding our founding history. This includes questions such as, were the frequent uses of detention without trial justified? Were those detained really communists plotting the violent overthrow of the government? We will leave these questions to the future generation who will be able to answer them better. Today, we will instead focus on three areas. One, we will like to introduce the history of Singapore during the ‘50s and ‘60s especially from the point of view of the losers, whose voices we do not get to hear much at all. Second, we will like to focus on the human side of the history, on how those detained without trial managed to regain their dignity and continue with their lives. Three, we will also like to hear the personal reflections of the players themselves on what we have learnt from our immediate past. So, without further ado, I’ll like to call on Jing Quee to tell us his story. Haresh is first going to read a poem by Jing Quee. HS: ‘Fajar’ (“Dawn” in Malay). and the dogs had ceased to bark. to seek out the stairs towards my incarceration. to the first cry of dawn. TJQ: Mr. Chairman, friends, ladies and gentlemen. That was a short poem I wrote many years ago on my detention, the day I was taken away. The word ‘Fajar’ is a Malay word meaning ‘Dawn’. It was also the name of the organ of the University Socialist Club, where I was actively involved in my undergraduate years at the University of Singapore in the 1960s; in ’62, I was its editor. I was detained in October 1963, less than 2 weeks after the general elections in September. I was the candidate in the constituency of Kampong Glam, running against Mr. S. Rajaratnam, who was then the Foreign Minister of Singapore. I lost that battle by a margin of 200 votes. Within two weeks, I was in detention. On the night of the arrest, I had attended a mass rally at the open grounds of Bukit Timah near the university to discuss a notice served by the government to deregister seven trade unions. This would effectively put an end to the entire leftwing organisation and trade union movement in Singapore. The meeting resolved to stage a general protest strike for two days, to start the next morning. The meeting broke up around midnight. I left home together with some colleagues from the Singapore Business Houses Employees’ Union. I was then a paid official of the union, which represented some ten thousand, mainly English-speaking workers from mostly European firms, but also some local firms. I stayed in a shared apartment at Balestier Road with two other persons. We went back to the apartment and talked in the living room. Somehow, we were not tired because of the tension of the day and also because of the events planned for next few days. Around 3 am, we broke, and I returned to my room on the second floor overlooking Balestier Road. Quite amazingly, I saw a few police cars stopping across the road. I called my fellow residents and together we watched the police getting out of the cars, carrying their flashlights, and crossing the deserted street towards our apartment block. S. T. Bani, who was then the president of SATU, the Singapore Association of Trade Unions, which was the general body for all the leftwing unions in Singapore, was staying in another apartment in the same block with his wife and young infant daughter. It was quite clear to all of us that this was an arrest operation and that possibly both Bani and myself at least, if not others, would be the targets. We drifted back to the living room and waited. We could hear the shuffle of feet up the stairs as they approached the apartment, followed by silence. When nothing happened, someone asked me in frustration whether I wanted to leave the apartment, in other words, to evade arrest. I said, no, we would stay. I told the others to take a rest because we did not know when the inevitable would come. I went to my bedroom wearing my long trousers and singlet and lay on the bed, waiting. Not sleeping, waiting. About 15 minutes to half an hour later, I heard a sharp knock on the door in the stillness of the night. I went out to the living room. The others were all congregated there. I motioned to one of them to open the door. The short poem, written in simple broken lines, tries to capture the tensions and emotions of the early hours when I was taken away. That night, 30 persons, mainly trade union leaders, and some candidates in the September elections, were taken. They included almost the entire central committee of the SATU, including S. T. Bani. Several other election candidates who had failed to get a seat were also arrested. But three candidates who were elected – Bani for Crawford, Loh Miaw Gong for Havelock and Lee Tee Tong for Bukit Timah – were detained. They were never given the opportunity to take their oath as Members of Parliament, although they were newly elected. But the October arrest, named Operation Pecah, was only the second wave of a much bigger arrest operation which started some eight months earlier. On 2 February 1963, a huge operation codenamed ‘Operation Cold Store’ was launched, in which about 120 to 135 individuals were detained without trial. Subsequent arrests took place. Michael Fernandez, for example, was arrested in 1964. Chia Thye Poh is well-known among the political detainees arrested in 1967. These arrests continued even into the 1980s – the ‘Marxist conspiracy’ arrests in 1987. As a result of the arrests, the entire leftwing opposition in Singapore collapsed and was decimated. These events took place more than 43 years ago. This means that two generations have grown up with no knowledge of what had happened during our early transition to nationhood. With your indulgence, I would try this afternoon to narrate what it was like to be a political prisoner during the ‘50s and ‘60s. One of the most frequently asked questions is: what was it like inside? It is a deceptively simple question yet difficult to answer in a short space of time. Very often, the questioner comes with a notion that the political detainee is different from a convicted criminal: that he is allowed to wear his own clothes and has access to reading material. The truth, however, is much more complex. There are two fundamental points to note when we discuss political detainees. First and foremost, there is a basic distinction between a political detainee and a convicted criminal. A convicted criminal has been subject to a specific charge in an open trial in court, where he has a counsel to argue his case and an appeal process afterwards. After the sentence, the court will fix a period of time for which he will serve a term of imprisonment. But despite the length of the sentence, even a life sentence, he can get out earlier with remission. A political prisoner arrested without trial is often dragged from his home in the night and never subject to any charge in an open trial. Technically, the detention order spans two years. But this was almost always extended again and again, so you have stark cases like Chia Thye Poh, who served a total sentence of 27 years; Dr Lim Hock Siew, close to 20 years; Said Zahari, 17 years; and Dr Poh Soo Kai, a total of 17 years or so over two periods. The second point is that once convicted, a criminal is sent to a definite place for confinement. A political prisoner, on the other hand, is subject to a series of detention sentences. You will be transferred about during the period of detention. Broadly speaking, every political prisoner underwent two specific types of detention. One was a period of solitary confinement, followed by a period of what they termed ‘normal detention conditions’. This can be reversed, the detainee can be cross-transferred back and forth. What is solitary confinement? In the 1950s and 1960s, there were two principal centres in which political prisoners were held in solitary confinement. They were Central Police Station and the CID along Robinson Road. These two centres contained a series of dark cells and dungeons. I was taken to Central Police Station soon after my arrest and put in a very dark room, larger than the average Housing Board room. It was completely dark and you couldn’t distinguish between day and night. A dim light bulb shone from the ceiling but you could not read. Your bed consisted of a cement slab, topped over by an old mattress, filthy and soiled with blood and sweat. There were no bedsheets or pillow cases. You were told to wear prison clothes and your personal clothing was removed and placed in a locker at the counter, guarded by Gurkhas. No strings were allowed. You were not even allowed to have your spectacles. No pens or other sharp objects for fear that you would do harm to yourself, so you were told. You were trapped in this room the whole day except when you were taken out. Food was served three times a day: breakfast, lunch, dinner, all on an aluminum plate, placed through the door and removed after you were finished. When you wanted to have a bath or go to the toilet, you had to knock on the door to attract the attention of the Gurkha guards. Bathing was from an open tap on the wall. Your bathing and toiletry were watched by the Gurkhas. It was a clear attempt to demean, humiliate and dehumanise. In the cell, even if you were the best sleeper, you could not sleep all of 24 hours a day. There were at least twelve hours when you were pretty alert. If you suffered from insomnia, you would have a much more difficult time. So you kept yourself alert by doing sports, jumping and exercise. I heard some tried to do meditation, headstands or singing. This is not a joke: these were the strategies the political prisoners had to find for themselves to deal with their predicament. MF: As Jing Quee mentioned, I was detained in September 1964, along with 39 other trade union members, students and Nantah graduates. I am really glad that we have this opportunity to share with you our experiences. Particularly, I see many young people from university and junior colleges. Many of you do not know what we went through in the ‘50s, ‘60s and early ‘70s. I was born in India and was brought to Malaya and Singapore by my brother before I was a teenager. I had my education in Malaya and Singapore and came to Singapore to study in the Teachers’ Training College. I was a trainee teacher at St. Patrick School in 1955. After I finished my training, I enrolled in the University of Malaya in 1960 to study law, where I got involved in the University Socialist Club along with Jing Quee. I was already hanging around the campus before that because some of my former school mates were quite active there. I wanted to become a member of the Socialist Club. One bright History student objected and told Tommy Koh, the Chairman of the Club at that time, that I did not qualify because I was already a member of the Catholic Student-Teachers’ Guild. Eventually, that person was overruled and I became a member of the Club. I played my part, mostly helping to run the business side of the Fajar for Jing Quee and others in the Central Working Committee. I thought I could pay for university by teaching at night for the Adult Education Board. But in 1961, after the split in the PAP, the Socialist Club came down on the other side of the fence. My night teaching was stopped by the Chairman of the Adult Education Board, the late Mr C. V. Devan Nair. Because I did not pay my tuition fees in 1962, I had to leave the university and went back to Selangor to continue teaching. I was then asked to come to Singapore to help man one union, the Naval Base Labor Union, which the PAP was trying to take over at that time. I sought the advice of friends, including Tommy Koh, then the legal advisor of the union and an old friend. He advised against going into the union unless I wanted to go to jail. I said I would think it over. I decided to go in despite the odds. Within a few months, we had a major strike of 11,000 industrial workers on 7 October, a day before Jing Quee and Bani were arrested. The strike issues were basically economic issues, linked to the grievances of the workers. Although it was portrayed as a political strike, it was certainly not so and we genuinely tried to settle the economic issues. But I think the PAP government and the Admiralty had a plan of not wanting to negotiate but were looking for an opportunity to break the union, vanquish the leadership and destroy the union altogether. Nevertheless, 95% of the workers supported the strike. Only after nearly 30 days, the government found a loophole in the union’s constitution that we had not held the annual general meeting to elect the union leadership, in May, as required by the constitution. Because of the ongoing industrial dispute, we had decided to defer the elections, which would take about six weeks, to a later date. This point was used by the government to declare the strike illegal and subsequently the union was deregistered. Loh Kah Seng and I have done some research on the history of the trade unions in postwar Singapore. We found out that the election issue was a technical one. Some other scholars also viewed the government’s action to deregister the union as too extreme, jeopardising the rice-bowl of 11,000 workers and their families. Can you see the irony of the Registrar of Trade Unions asking me, the General-Secretary of the Naval Base Labor Union, to show cause why the union should not be deregistered, when the Admiralty had already closed down the union and confiscated all the records? Nevertheless, we replied to the Registrar with whatever information we had. I now come to my detention. I think the objective of the government in arresting us was to isolate us from political life and to break us mentally and physically. They tried this several times by depriving us of our freedom; by putting us in solitary confinement for long periods; by putting us through long interrogations; by depriving us of reading materials and usual food rations; and by isolating us from the outside world. We could not have access to our legal counsel, T. T. Rajah. At first, we were confined within an open yard, then we were locked up in ‘E’ dormitory in Changi. I was confined there from ‘64-’67, when some of our top leaders were taken away, such as A. Mahadeva, Dr Lim Hock Siew, Said Zahari, and Chia Thye Poh, who were removed to Queenstown Prison. I was put into a small cell, and I think the objective was to make me a mental case. They brought in the chief of Woodbridge Hospital to examine me. The first thing he asked me was: ‘Do you know what is the date today?’ [Background laughter] ‘I know better than you do’, I said. [Background laughter] He got angry and went away. [Background laughter] They brought another doctor and he was nice. He spoke to me nicely, examined me and said, ‘Well, you are quite all right. Basically fit. Mentally alert’. So I was not sent to Woodbridge as some of our friends were. I was manhandled in detention and still have some of the ‘prizes’. In 1978, an old doctor friend removed some of the blood clots in my stomach. Some of you get gold prizes for running the tracks. So this was my ‘gold prize’, I still have a few on my stomach, inflicted on us by the prison officers during detention. In the meantime, they were building a new prison for us called Moon Crescent Centre. What a beautiful name. [Background laughter] We were removed to Moon Crescent Centre in 1970 where there were many more restrictions. Food was rationed, the quality was poorer and they were demanding that we did manual labour just like the convicted prisoners. We refused and coordinated with fellow detainees in the other blocks; in each block, there were seven or eight of us and I think there were about 200 hundred detainees in total at that time. We coordinated a hunger strike, which started on 9 December 1971. This strike lasted 135 days. We decided that we would not take anything except water for the first week. I think after the 8th day, many of us collapsed. The government and prison authorities were worried about our lives. They decided to force-feed us. I will demonstrate how the force-feeding was done. I think some of you may have seen it on TV in other countries but have not seen it happen to us. [A chair is brought in and Fernandez sits on it] I was made to sit down with my hands handcuffed behind. One huge warden stood on the handcuffs so that I could not move. The other Punjabi warden, the biggest one, he sat on my lap. [Background laughter] Then, he used a jaw-opener to pry my mouth open. The hospital assistant stuck a hose into my mouth and using a funnel, poured milk into my mouth. I tried to struggle but could not. [Fernandez stands up and walks back to the mike stand] But the milk wouldn’t stay in my stomach. After the ordeal, I used to vomit. This went on for a long time. Now you look at me with the big stomach protruding. [Background laughter] In those days, I lost a lot of weight and could not wear my shorts. They moved me to the prison hospital and I was put on a drip for 23 days. Then, my stomach stabilised, and they transferred me back to prison. We continued this ordeal of refusing to eat and they continued to force-feed us milk or thin porridge. We held on. The government knew that they could not break us physically or mentally. I think a decision was then made to release us, slowly, a few at a time. I was sent to the interrogation centre at Central Police Station and kept there for three months. They were trying to get me to give up. I did not want to give up. I have to say that I am a Catholic. I asked myself: ‘Trying to help the workers, is it a sin?’ The answer came back to me, very loud and clear: ‘No!’ They knew they had to release me. The international pressure to release us was also mounting. I was released along with a few others in April 1973. After I was released, I had nobody in Singapore, except my wife’s relatives and a cousin who used to visit me occasionally. I had no job, I had applied to go back to teaching but they would not let me. I tried to give tuition; initially I had 13 students. Within two weeks, all of them disappeared. Then, I sought the advice of friends like Tommy. He advised me to sell insurance, which was not my cup of tea. Nevertheless, I had to earn a living. Friends like Jing Quee and others helped me buy a scooter. I went around selling insurance, earning enough money to get married at the end of December. Now, the other point is this: even after I was released, long shadows still haunted me. I am an active person, not a thinker or creative person like Jing Quee. I wanted to do something for society. I became a member of the National University of Singapore Society in 1973 and a committee member a few years later. One incident is still fresh in my mind: in 1987, I was also an active member of the Indian Chamber of Commerce because of my business dealings. I was sent to Japan on a 6-week study tour, representing Singapore and studying the small- and medium-sized enterprises in Japan. I was also Chairman of Current Affairs in the Guild House. We organised a research project on small- and medium-sized enterprises in Singapore. Seventeen members of the Guild House, mostly academics, volunteered to join the project. So, we went to the Economic Development Board, which was responsible for helping small- and medium-sized enterprises. The Chairman of the EDB told me, ‘Is it any of your business to question us about our work?’ When we reported to the managing committee, they said, ‘Please stop the project. We do not want to clash with the EDB’. So that is one area. In 1990, I was living in Toa Payoh, in a 3-room flat. I could see, being a school teacher, many kids running around in the afternoon, even late at night. I offered to look after them and help them with their homework. This was frowned upon by the Community Centre. They said, ‘No, you cannot do that’. Same thing in 1996 when I moved to Upper Boon Keng. My friend in the People’s Association asked me to help out there. Again, orders from the top came: ‘No!’ These are what I mean by the shadows of my past still haunting me. TCK: I would like to ask our panelists how their arrest affected their family. MF: I was alone in this period, except for my future wife’s family who looked after me, visiting me once every fortnight. My cousin’s sister, my brother and my sisters’ family were all in Malaysia. When I came to Singapore in May 1963 to join the Naval Base Labour Union, my second brother-in-law was down with a stroke, and that sister also needed help. These were the financial problems and the family responsibilities I had. Of course, the family was not happy about my political involvement but finally accepted my decision. My detention was a period of hardship for many of my family members. Also, my eldest brother died of a major heart attack in 1968, when I was still in prison and I was not allowed to attend the funeral. In the family, the children were also quite young and needed guidance, though not necessarily money. TCK: One other thing we like to discuss today is how writing enables the political detainee to heal or regain their dignity. I would like to ask Michael because yesterday you showed me your prison notebooks you wrote during the incarceration, in really tiny script. You worried about not having enough paper, so you saved space in the writing. MF: It was not a notebook. I wrote on toilet paper. We were not given writing paper. I used to hide sharp, little ball points in our trousers. We were only allowed six reading items. Most of us were learning languages then; I was learning Mandarin and Tamil, so I had three dictionaries out of the six reading items. I also usually have a magazine, so I was allowed only two books. We used to borrow books from one another and read avidly and as quickly as possible. I made notes of what I read. Sometimes, I copied wholesale the contents onto the toilet paper or made critical notes on the books I could understand. At other times, I could not understand much. Now, some of you might wonder, how do you write and keep these toilet paper notes? We used to have raids in our cells once in a month. I hid the notes by rolling them up like toilet paper, with the notes on the inside. When we got news from the prisoners that there was going to be a raid, I hid the notes. How did I carry them from prison to prison? I hid them in my clothes. When I was released, I was interviewed by the Oral History Unit of the National Archives. I asked the Archives to microfilm the notes. Recently with Loh Kah Seng, we were able to find the microfilm reels in the Archives. We got, I think, about 600 pages. Those who would like to have a look, Kah Seng will show you. 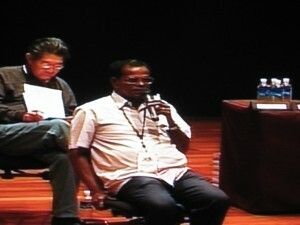 [Loh Kah Seng shows the printouts of the microfilm to the audience] I kept myself busy in prison by reading and writing. This might have had some sort of therapeutic effect psychologically. I would not say healing. Both Jing Quee and I agree that political healing has a different connotation. We are not going to discuss political healing because the wounds are still there and still fresh. This writing was at times depressing for me but it kept me going. TJQ: My own experience is that very few of us wrote in prison. I tell you why: the simple reason being that we were living in cramped conditions. There was no paper to write while Michael managed, I do not know how, to get some toilet paper. Time was spent instead talking, discussing, self-reading, and self-studying. Many of us, in fact, learnt new languages. I went to prison knowing a little Chinese from my early years in primary school. But with the help of my fellow detainees, I was able to expand my vocabulary and read fairly well. More importantly, when I went in, I could only speak what they termed ‘bazaar Malay’, probably a hundred or less words. I spent time learning Malay from my fellow prisoners. Many of them, you would be surprised to note, especially the Chinese-educated detainees, spent much time studying Malay. In the cell I was in, there were two dozen others. I can now recall at least six of them passed Standard 1, Standard 2 and Standard 3 in the government Malay examinations. Standard 1 was supposedly equivalent to the primary standard, Standard 2 to the ‘O’ Level and Standard 3, to the ‘A’ Level. There was a strong motivation to learn Malay because Malay was the national language. More so because many of them were Chinese-educated, so the two languages they sought to study were English and Malay. Many of them managed to achieve a very good command of Malay. I am glad that I obtained considerable fluency in Malay and have enjoyed reading a wide range of modern Malay and Indonesian writers. I did not think of writing although I very much wanted to write. The conditions were not there for writing: we are also subjected to regular monthly checks because we were not allowed to keep things brought in unlawfully, such as books. James Puthucheary wrote his book [Ownership and Control in the Malayan Economy, published 1960] in prison, but that was in the earlier period, when his wife Mavis could even assist him by sending materials to him. But I think in the 1960s in particular, there would have been no such provisions. I regret very much that I could have not documented what happened on a daily basis and would now have to write my experiences purely based on my memory and conversations with friends. TCK: Do you feel, after your long periods of detention that, when you came out, you found yourselves somewhat irrelevant in modern Singapore? Or that what you experienced and what happened are still relevant today? TJQ: I may be luckier than many others. When I went into prison, I was already a graduate. After I was released, I went to study Law, a profession I didn’t want to do in the first place but to which I eventually adjusted. I was able to bring up my children and give them a fair education. But I knew of many Chinese-educated friends who were not in this position. They had to undergo much greater difficulty. But I was often amazed, and still am, by how the discipline and motivation they had in the past helped them develop new career paths. Many of them never finished university education. Some of the Nantah students never graduated. There were even high school students who never finished Standard 3. But despite this, I am continually amazed by how the Chinese-educated detainees have adjusted to new conditions of life and brought up children who are now doctors, lawyers, journalists, engineers. I give you two examples. Lim Chin Joo was a law partner. He was arrested in 1956 and did not finish his Standard 3. In prison, he completed his ‘O’ and ‘A’ Levels and obtained his law degree from the University of London. When he was released, he went to National University of Singapore to do his Master’s and became a lawyer. His case is probably unique but also a demonstration of the strength, character and discipline of many former detainees. Another example was an old friend, the late Salahuddin Ghouse. He was in his mid-30s when he was detained and was formerly a law clerk, self-taught and without any certificate. He finished his ‘O’ Levels in prison and, when released, went to study Law in London and became a lawyer. So, these are some stories of an entire generation whose lives were deeply affected by detention, but many of whom discovered new directions and paths, and reaffirmed the basic human values. MF: Although I did not graduate with a law degree from the University of Singapore, I already had a profession. I was trained at the Teacher’s Training College and had been a teacher in Singapore and Malaya. After I was released, I was not allowed to teach and became an insurance salesman. These experiences, as Jing Quee mentioned, kept us strong. We felt that we could survive in the new circumstances in Singapore. After nine years in Changi, I did survive. I tried to teach my children certain values in life, which I think are more important than money, which they still hold true. I have four children, all of them are here. I consider that the legacy I was able to give them, are the values in life, not money. These are lasting values for their survival, as citizens of Singapore. TCK: Thank you. The floor is now open for questions. Within a fortnight of the forum, the Ministry of Home Affairs submitted a firm rejection of the views of Fernandez and Tan on ‘political healing’ in a letter to The Straits Times. The Ministry insisted that both men were not opposition politicians engaged in the democratic process but belonged to the Malayan communist movement which sought to create ‘civil disorder and destabilise the country’. An academic based in Singapore viewed this response as demonstrating the state’s reluctance to endorse a hidden history of the past for public discussion. Still, other local commentators emphasised that the forum nevertheless provided an important launching pad for either reconciling the embittered conflict which had divided postwar Singapore politics or expanding the public sphere for political discussion in the present day. Fernandez and Tan continue to do what they had broached on at the forum: to articulate their little-known accounts and perspectives of the past, relate their experiences of detention and, more generally, to consider the relevance of recent Singapore history to the present. Fernandez embarked on a history project on the University Socialist Club, of which he and Tan had been members in the 1960s. Tan wrote a number of eulogies and commentaries for former leftwing comrades who recently passed away and published his reflections on the experience of detention without trial. See Robert Yeo’s Singapore Trilogy: Are You There, Singapore? (1974), One Year Back Home (1980) and Changi (1997). Said Zahari, another former political detainee and journalist of the Utusan Melayu newspaper, now based in Kuala Lumpur, had also agreed to speak but was unable to attend due to poor health. Postscript: “It was ST Bani who wanted to see me and JQ who knew my contact was asked to contact me to come down to Singapore.” Email, 28 August 2009. Michael Fernandez and Loh Kah Seng, ‘The Left-wing Trade Unions in Singapore, 1945-1970’, in Trocki and Barr eds, Paths Not Taken: Political Pluralism in Postwar Singapore (Singapore: NUS Press, 2008), pp. 216-20. James J. Puthucheary, Ownership and Control in the Malayan economy: A Study of the Structure of Ownership and Control and its Effects on the Development of Secondary Industries and Economic Growth in Malaya and Singapore (Singapore: Published by D. Moore for Eastern Universities Press, 1960). Kevin Blackburn, ‘Ex-Political Detainee Forum at Singapore in 2006’, Oral History Association of Australia Journal, 29, 2007. Straits Times, 3 March 2009; Today, 9 March 2009; Liew Kai Khiun, ‘Struggles rather than Troubles? A Post-65 Singaporean and the Post-1945 ‘Communist Subversives’, Yawning Bread, July 2006, http://www.yawningbread.org/guest_2006/guw-117.htm, accessed 2 April 2009. Loh Kah Seng, Lim Cheng Tju, Seng Guo Quan, and Edgar Liao, The University Socialist Club and the Struggle for a Malayan Nation, forthcoming book. Fernandez was instrumental in the genesis of the project and is its research coordinator. Tan Jing Quee, ‘In Memory of Linda Chen (1928-2002)’, s/pores, 1 (1), April 2007; ‘Ho Piao: A Personal Recollection and Appreciation’, s/pores, 1 (1), April 2007; and ‘The Enigma of A. Samad Ismail’, s/pores, 2 (1), 2009, http://spores.wordpress.com/journal/vol2_1/1_enigma, all accessed 6 March 2009; and Tan Jing Quee, Teo Soh Lung and Koh Kay Yew (eds), Our Thoughts are Free: Poems and Prose on Imprisonment and Exile (Singapore: Ethos Book, 2009). Before the forum, Tan authored ‘The Poetics of James Puthucheary’, in Dominic J. Puthucheary and Jomo K. S. Jomo (eds), No Cowardly Past: James Puthucheary, Writings, Poems, Commentaries (Kuala Lumpur: INSAN, 1998), and ‘Lim Chin Siong – A Political Life’, in Tan Jing Quee and Jomo K. S. (eds), Comet in Our Sky: Lim Chin Siong in History (Kuala Lumpur: INSAN, 2001). First, I would like to congratulate the organisers for ensuring at least some of the honest truth of the past is revealed, and those who perpetrated a brutal regime put to shame. All attempts will be made to hide the past , and even present, political mechinations to deny human rights by an ingenious interpretation and callous imprisonment of those who struggle for human justice and freedom, by those who were and are in power to justify their brutal deeds. Second, I reach out to people like Michael and Jing Quee and many other friends to marvel at their discipline and dedication to ensure a just and free society. Third, I urge the youth of today not to be mersmerised by the glitter of material progress, but to secure a society which will respect human dignity and ensure a just and prosperous society based on democracy for the progress of humanity. The evil and calculated deeds by men filled with greed and no principles must perish at the roots. The youth of today must be made to be aware of this and always fight for justice and freedom.